Those keeping up with papers on palaeoethology may well have noticed that a number of papers have gone online in the Journal of Zoology of late with a common theme. Darren Naish has a paper on the behaviour of fossil birds, Andy Farke has one on combat in ornithischians, and Pete Falkingham has a paper on interpretation of trackways. This is not a coincidence, but part of a special issue of the journal out today on behaviour in the fossil record and all of these contributions will eventually be published together with a number of others in a collection I have assembled as a guest editor. The volume has ended up rather dinosaur-biased which is unfortunate as a number of other papers were promised from other fields (including on whales and the Burgess shale) which never appeared and giving the set a more dino-centric appearance than I had planned or hoped for. Adding to this is in fact my own paper in the volume. This was something I had been working on for a while before being asked to compile the special issue (indeed the fact that I was working on it, and it was intended got the journal may have precipitated the invitation) and in the context was the perfect home for the paper. As with similar cases I had nothing to do with my own manuscript and it was submitted separated and edited and refereed independently by the journal, and only after acceptance could it be added to the list. Most of the papers are reviews of one form or another, and in my case the paper written with my friend Chris Faulkes looks primarily at issues of hypothesis creation on behaviours for fossil taxa. Our main contention is that in the past palaeontologists have been a bit over zealous in the production of hypotheses and the way in which they have been generated has made them difficult to assess or even simply discuss and in at least a few cases hould probably not have been suggested at all. We don’t think it inappropriate to generate hypotheses that cannot be immediately tested, or those that are difficult generally to assess, but a hypothesis must have at least some support behind it to make it valid in the first place, and poor uses of terms, lack of specificity, or even use of fundamentally flawed concepts have meant that there are problematic ideas in the scientific literature. Mutual sexual selection is perhaps a good example here. I’ve now penned a number of papers with various authors about the issues surrounding this idea and how it may fit into archosaur evolution. 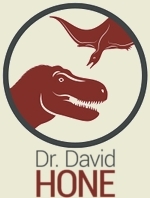 The point is not whether or not we are right about this, but more the fact that this was something hinted at by Darwin, written about by Huxley and extensively studied by numerous ethologists for decades, and yet many palaeontological papers discussed sexual selection purely in terms of dimorphism, or the fact that sexually selected features should feature on only one gender, or indeed that sexual selection should be mutually exclusive of other functions. None of these things are true, so hypotheses that rely on one of these as are starting point are going to be fundamentally flawed, or at least problematic. Thus the paper sets out to identify some key areas where we feel mistakes have tended to be made (myself drawing on examples from dinosaurs and pterosaurs, Chris from his area of expertise the mammals) and to also then try to find a set of guidelines that might help the better generation of hypotheses allowing for reduced confusion and better testing. Naturally we think this is going to benefit researchers, but given the rampant hypothesising that often accompanies any online discussions of the behaviours and ecology of extinct animals online and in other informal venues, it might just help clean up some of the more egregious suggestions that can be put forwards based on the most tenuous of links. Some of it may sound excessively simple and even obvious, but that doesn’t mean it hasn’t been an issue in the past. I actually had a chat with an ecologist the other day who bemoaned a similar set of problems in her field, and I think the issue is more one of advancement and general improvement that systematic errors or poor science. Naturally we did try hard not to pick on individual papers (or people) but we did also want to point to some specific examples of the kinds of problems we were discussing and so a few things get the finger pointed at them, but they have mostly had specific rebuttals in the literature already, or were very much generic issues. Hopefully then, we’ve not bent any noses out of joint. I was certainly grateful to Andy Farke for reading an earlier version to check for overall tone and to see if it was working the way we wanted. Anyway, here are a few of the things we looked at. Terms need to be more specific. Talking about ‘parental care’ say in general terms isn’t very helpful when this can encompass pre- or post-natal care, or both, and differing degrees of commitment from parents over very different timescales. So a statement like ‘X showed parental care and Y didn’t’ may not mean much if the parental care shown was minimal, or two papers might say this where one is referring to all parental care, and the other only post-natal, making them hard to compare. Overlooking counterexamples or complexity. Descriptions of species or clades as ‘social’ has been creeping into the literature on dinosaurs and yet even if you do somehow have super evidence for sociality in a species, applying that to other taxa, or even other member of the same species is not necessarily a great idea. While we do have highly social species that basically can’t function when not in a group (like some molerats) even famously social animals like lions often spend part or much of their time apart, and some like cheetahs can be incredibly plastic, switching from social to solitary multiple times in their lives, and yet it would be a big mistake to suggest tigers are fundamentally social because their nearest relatives the lions are. Extreme examples or oddities are useful to provide context or even limits on ideas. Some species have incredibly specific requirements or only live in certain environments, while others are much more adaptable. You don’t really find sand cats outside of deserts or dry environments, and while lions show up in quite a few places, you can get puma in everything from high mountains to praries, deserts and rainforests, yet there’s not especially obvious about their osteological anatomy that they could occupy so many more environments. Make sure the analogy or reasoning behind it is actually correct. Not too long ago it was suggested that azhdarchids had long necks to reach into carcasses of large dinosaurs. However, given that the heads of the biggest azhdarchids (estimated at getting on for 2 m) are longer already than the longest sauropod ribs we know of (2 m) then any kind of neck is redundant in this context, let alone a long one, and vultures do fine with absolutely short necks and heads while feeding on carcasses of animals many times their size. The analogy that the hypothesis is being based on is fundamentally false and if that is the sole support for it as a concept, then it’s really not much of a hypothesis. The short version of much of this could well be summarised as “look more at the behaviour of extant organisms”. I know Darren bangs this drum a lot on TetZoo and I’ve said it in plenty of talks and to lots of people if less so online. It is confounding when people say that such-and-such behaviour isn’t seen in reptiles when it plainly is, or that only animals with feature Y can do this behaviour when it’s known in numerous species, that are just less specialised towards it (or even show no obvious adaptations – like tree-climbing crocs). True this may not be common or normal, but to assume that it’s impossible, or that there is a perfectly consistent correlation is incorrect. Part of the difficulty is a lack of good data on many of these things. Ethologists can simply observe behaviours and therefore don’t necessarily go looking for osteological or other correlates that we might be able to detect in the fossil record. That does make things harder, but we need to try and avoid getting trapped by ‘we don’t know if this correlates therefore this hypothesis is valid since we don’t know’. I am actually not against (in principle) hypotheses that are difficult if not currently impossible to test, but as with the azhdarchid neck example, there is a difference between something that can’t be tested, and something which is not even supported at the most basic of level. A hypothesis has to have some support, and some specificity about that will go a long way to making things much more clear and amenable to testing and allow a great fit of existing and future data. What is most remarkable is how far things have come so quickly. So many modern analyses are using things like FEA and functional morphological analyses, are looking for correlates of behaviour (or aspects of ecology that link to behaviour), and more and better comparisons to extant forms and their anatomy are being used. Such important work or our understanding of the biology of extinct animals should not be let down by poor hypotheses and we do hope that, while things are improving already, this will help better communication and understanding of ideas. Not too long ago, Matt Wedel had an SV-POW! 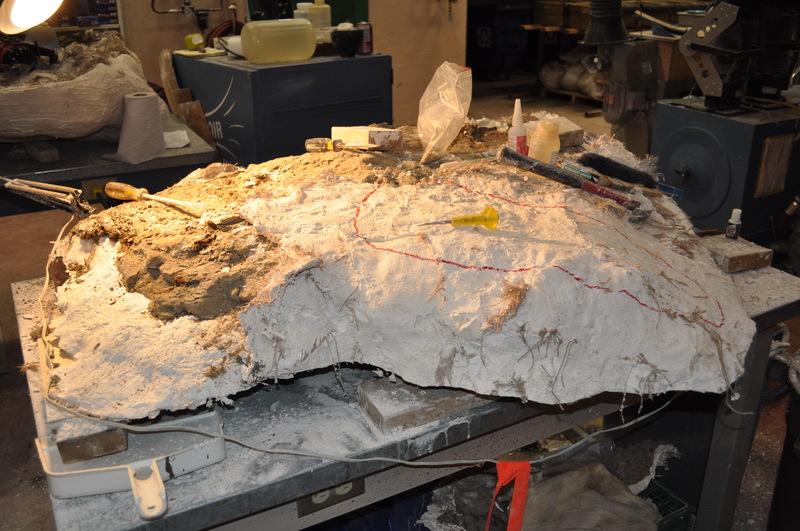 post that talked about ways of diagnosing an adult vs non-adult sauropod. Inspired by this and the fact that I have recently been playing around with issues of ontogeny in pterosaurs, I decided to write something similar for the non-avian Mesozoic fliers. 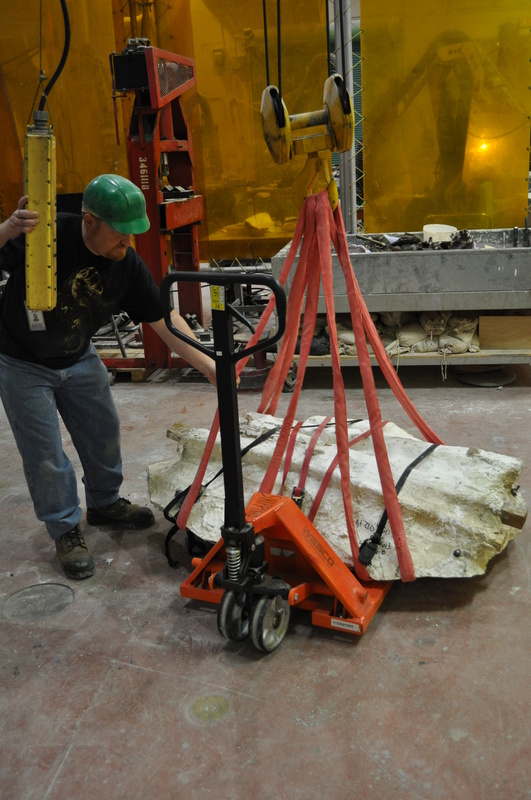 If you have a pterosaur specimen in front of you, just how do you know if it’s an adult or not? Obviously there are some general indicators that are pretty good for vertebrates as a whole that will get you quite a long way (even if this is a new species). Size is obviously rarely a great indicator, but if you have a pterodactyloid with a 20 cm wingspan then it’s going to be a juvenile, and likewise if you have a rhamphorhynchoid coming in close to the 2 m mark it’s very unlikely to be anything but a big adult. Young animals (and especially very young animals) tend to have big heads compared to their body and especially very big eyes compared to the size of the head. A bunch of fusions are absent in young pterosaurs that are present in adults too, just as you’d expect for most animals. 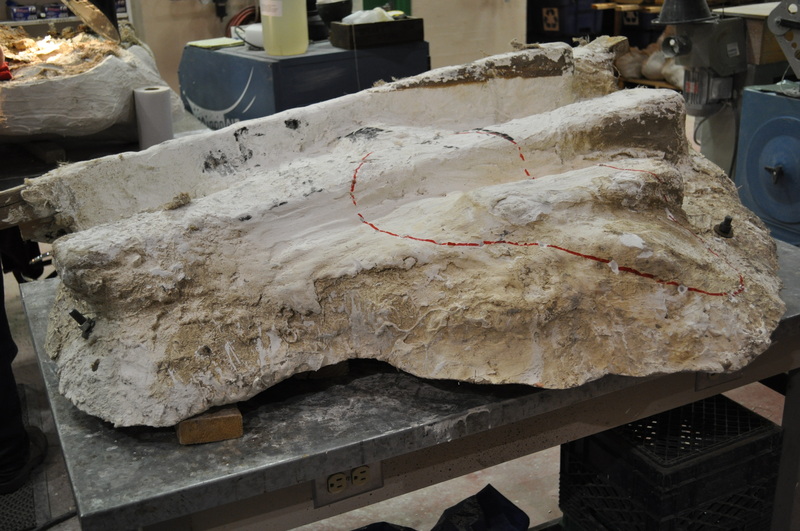 The sutures between the centrum and neural arch of the vertebrae will be open in juveniles and closed in adults, and similarly the elements of the pelvis and sacrum, and the scapula and coracoid will be separate in young animals and fused together in adults. Pterosaurs also have some characters of ontogenetic change that are rather more peculiar to them than vertebrates in general. 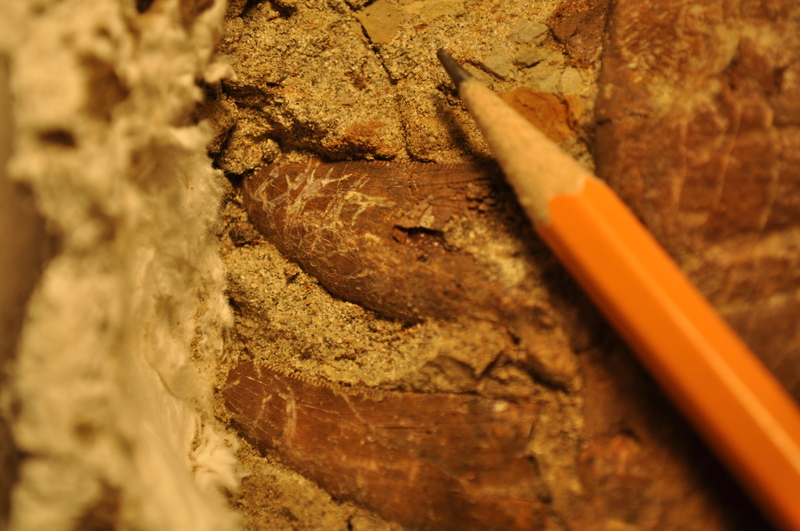 Very young pterosaurs also tend to have a very grainy texture to the surfaces of their longbones, despite the fact that even embryonic pterosaurs have a pretty ossified set of bones (unlike many young animals). Smaller pterosaurs also tend to have various parts of the skeleton being less ossified and rather amorphous compared to those of adults. The tarsals are often not well ossified and can be missing (well don’t preserve) and if present may be very simple shapes. The carpals tend to look more ‘blobby’ and lack the detailed morphology seen in adults and will be separated into multiple elements whereas in adults the wrist will primarily be formed of just two massive elements (plus the pteroid). Finally, while obviously you would expect skulls to fuse up during ontogeny, pterosaurs do tend to take it one step further than most. 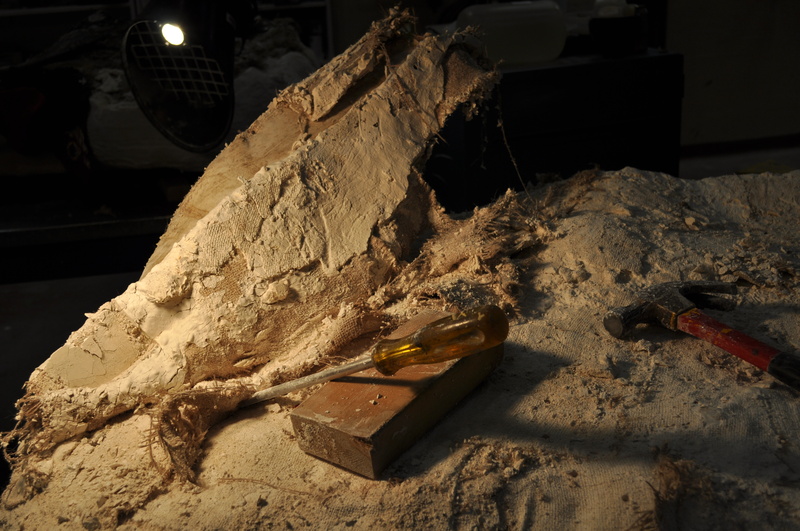 Rather like birds, in adult pterosaurs the sutures all but disappear, or even go entirely, such that the skull looks like a single smooth piece of bone. 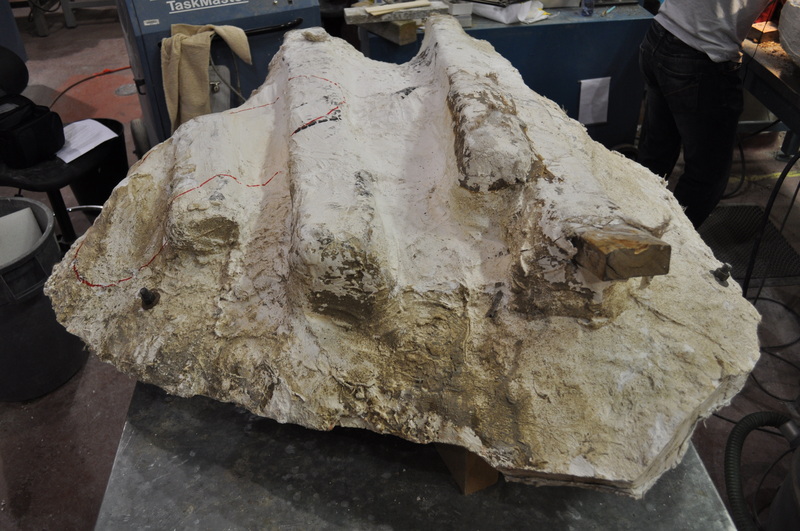 Also as in some birds, bigger pterodactyloids have a notarium and this only fuses up and fully develops in adults. Similar to the point above about absolute size, the presence and development of some form of head crest is indicative, but not a great indicator of age. Yes a massive and elaborate crest in an animal is indicative that it’s an adult, but there could be a fairly well developed crest in an animal that is close to becoming and adult and of course there are taxa without crests and in at least once case it appears that females don’t have crests. As in mammals, but unlike dinosaurs and birds, pterosaur also have epiphyses. The growing plates at the ends of the long bones physically separate the main shaft of the bone from the proximal and distal ends, so things like the femur can appear to be in three pieces. Obviously as growth slows towards maturity these epiphyses slowly disappear as they fuse into the single element that you would expect to see. So in short, something that is small, with grainy textured bones, a big head, with big eyes, unossified tarsals, amorphous carpals, no crest, clear sutures in the skull, no notarium, and separated scapulocoracids, pelvis, epiphyses and neurocentral sutures is going to be a young juvenile. And the close these various features get to the opposite condition the closer the animal is likely to be to adulthood. As ever with such things these are not absolutes, but merely guides. Good guides, certainly – you simply won’t see a notarium in a very young pterosaur, or open neurocentral arches in a big, old adult. 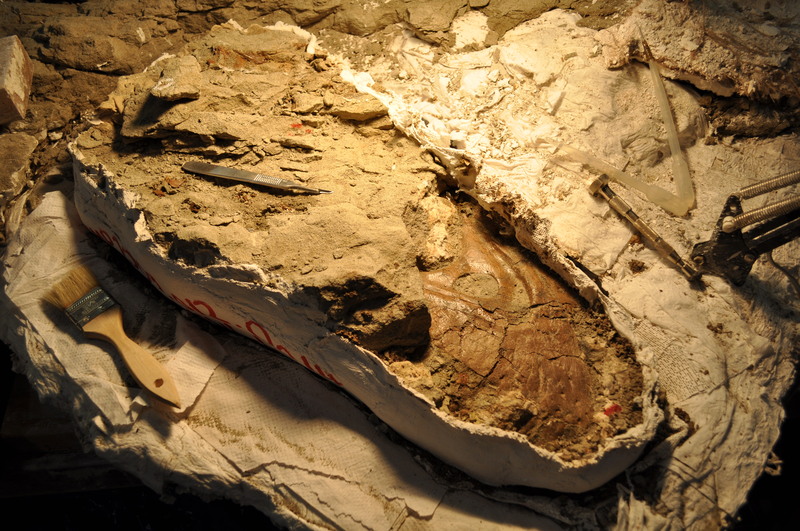 However, in terms of determining more subtle difference in age it will be tricky – one animal may have fused up the notarium, but may have incompletely ossified tarsals and another could have the reverse. Although at least some characters do seem to have a bit of a pattern (the scapulocoracoid seems to fuse pretty early in most things) a general lack of numerous specimens of different ages makes it hard to do any more detailed analysis. Still, in terms of gross age (hatchling – young – adolescent – adult) even for a specimen of a previously unknown species with no obvious close relatives, it should be relatively easy to determine the approximate age of the animal. I was chatting to Mike Taylor the other day about Cladestore as I couldn’t find the page I needed and was surprised he didn’t know of it. To be fair it did start off well and then rather sank, but the principle is sound and it seemed relevant enough that he might know of it. It is, in short, an archive for the various files and datasets used for phylogenetic analyses. Obviously these are generally published alongside any paper that they feature in, but typing these out again or taking the raw data and formatting it into a useable manner can be a pain, and it’s not always easy to get things out of the original authors. The idea therefore was to create and archive for these files so they were easily accessible to all. Since this does seem little known, it’s well worth advertising. And I should add that despite it’s slight antiquity, I believe they still take submissions so send ‘em your nexus and tre files. Coupled with my reference to the Paleobiology Database earlier and it got me thinking. It would be nice if there was a single, simple, one-stop-shop for all manner of palaeo websites and online resources that are useful to researchers and those interested in the field. So I’ll try and create one, as it’ll help me learn and I expect, help my colleagues. So, anything you can think of, do submit it below. I’m thinking general stuff – a database of tyrannosaur specimens, or pterosaur papers is fine but it won’t be of much use to too many people so it’s not really worth putting here. I’m thinking of major resources that cover whole fields or are simply so vast with the data collection that they are must-know-abouts. Here’s the few I can think of, add yours below and I’ll package them all up. And do spread the word please – blog and tweet this. This could, I think be very useful to a lot of people. Rankings of Palaeo Journals – Kenneth de Baets’ list of journals and things like IF, SJR, OA etc. Figshare – data of all kinds from unpublished studies. Biomesh – FEA models and properties. Biodiversity library – huge archive of books and paper. I’ve started adding these as the comments come in so it’s easier for people to see and avoid duplicates rather than have to hunt through the comments to see if they have been suggested or not. 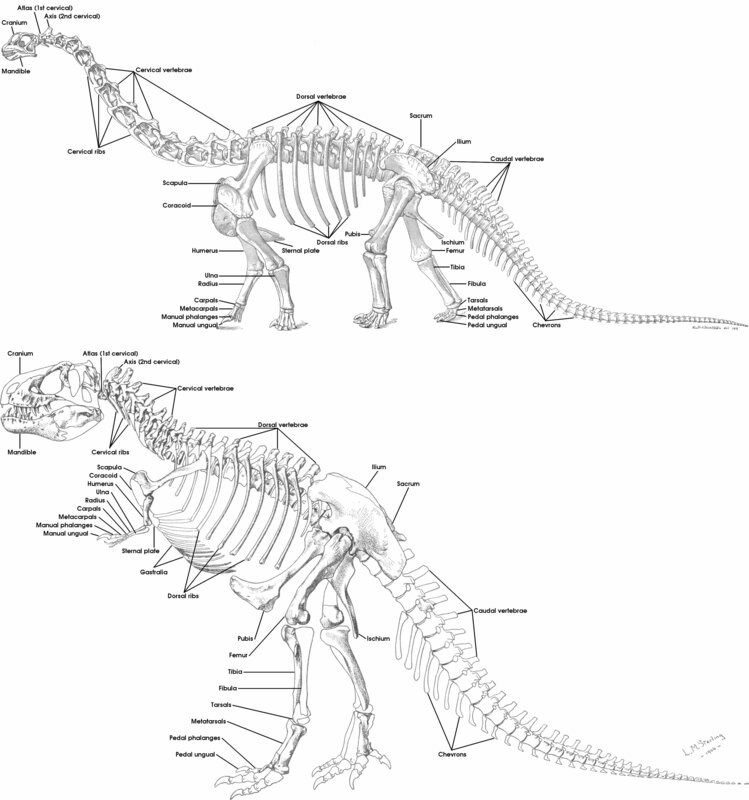 Inspired by the posters featured in this post of mine Mike Taylor has gone and made this picture comparing a sauropod and theropod to show the homology of all the elements. He’s stuck it up on SV-POW, but is encouraging people to use it in their teaching so I thought I’d repost it here. Thanks Mike and great job. Yesterday I was talking about authorship lists on papers and what this can mean, or rather imply, for who did what within a paper. An important extension of this is appreciating who has what responsibility for which parts of a paper and who intends what. Obviously papers do not state exactly who was responsible for which parts of a given manuscript, but if you are familiar with the filed and the researchers then at least some parts are probably obvious or pretty clear such as the appearance of a specialist on histology or taphonomy on a paper which includes elements of this but doesn’t focus on it. This can tell you who is responsible for things in the sense of their creation, but true responsibility and intent can be rather different. By tradition and for practical purposes the lead author has responsibility for the content of the paper and any mistakes in there or other issues. In theory he has control over the manuscript and as such gets the credit for the work and thus also takes the blame for its failings. Naturally however, the truth can be rather different. There could have been a lot of help from a supervisor if the work is by a young researcher, and various issues can mean that actually the first author may not have had full control over the paper. I can think of a few papers where I know the first author is working in a second language or well outside their normal field and they are not sufficiently blessed in them to have possibly had much to do with the manuscript as a whole, let alone take credit or responsibility accordingly. Equally, if the lead author is likely relying on a specialist for some aspect of the paper, that person should be held responsible for the issues there. Yes the criticism could be directed to the Smith of Smith et al., but if it’s pretty obvious he didn’t put together that part of the manuscript then don’t judge him harshly and take the issue up with the person most likely concerned. On a different note, if it is a long and complex paper with many authors then don’t be surprised if not everyone agrees with everything in the paper. As before, many people can be credited on papers for different reasons. If I put in a substantive amount of effort into a project, I’d want credit on the paper (and of course to show to my funders etc.) but I might not agree with or be happy with the final outcome. Profound disagreements can lead to people taking their name off of papers, but that isn’t always a practical issue for all concerned. Even the lead author may not agree with everything said in his paper if he writes democratically and gets outvoted by his colleagues or again he’s relying an expert and trusts his judgement on interpretation even if he disagrees. Ultimately for me this all comes down to the inaccuracies of authorship lists and so on. Clearly there is a practicality issue and I’m not advocating that they change. As things stand these issues are not really very big, and if you have a problem or are curious a quick e-mail to the lead author will generally clear things up (Did you write this bit? Do you really think that? Does Jones agree with that statement, he said the opposite in his last paper?). Still it’s worth remembering and bearing in mind both how papers are put together and what that can mean for people’s take on even their own work and the implications of having your name on a given paper. Some time ago I muttered something along the lines of “there are lies, damn lies and authorship lists”. It is really one of the more contentious sides of research and an endless source of strain to some people (and to everyone on occasion) as with more than one author there has to be some kind of order of authors on the paper (Jones and Smith, or Jones, Smith and Smythe), and at least one person is probably going to be less than 100% happy, and it is almost certainly not going to really represent quite who did what on the manuscript. Moreover, who even gets on the paper and for what reason can vary from field to field (lab techs seems to regularly be included as authors on molecular papers, whereas fossil preparators are rarely included on palaeo ones) and certainly within fields too, and there are some arcane rules hidden away in those lists. Indeed I’m sure there are others that I’m unaware of even within biology/ palaeontology and certainly beyond. Things also vary according to the structure of a paper too. If you already have half a dozen or more authors on a small project and someone comes in with an important point or can add an extra analysis or whatever, then it’s unlikely to upset the applecart to add them in as an author, and it probably represents a reasonable approximation of the contributions with so many involved. If however you’re refining a 50+ page monster you constructed yourself then the same amount of help will likely only get you into the acknowledgements: it’s not really fair to split the credit as Smith & Jones as opposed to Smith alone for that (proportionally) little. Some people probably will of course, when others might not go that far in the first example, but such is life. It’s also the reason why younger researchers (I think) get more concerned about this, when you only have a handful of papers to your name, missing out on one, or dropping down the authorship list a few places can make a big difference to your overall record, whereas seasoned researchers will have this effect balanced out over a number of papers and are generally more generous with credit (and can afford to be). Certainly it can be frustrating when some people seem to endlessly get added to work by their colleagues or supervisors or there are 20 authors on a 3 page paper, it looks like someone(s) isn’t pulling their weight and are getting undue credit. To be honest I think this is a pretty open, if dirty, secret but it survives because really there’s no demand by journals for authors to justify exactly what they did, and in any case people can (and I suspect at least some would) simply lie. Obviously the order generally reflects the level of work committed to a project. The first author did the most, the last author the least, but it’s rarely that simple. In palaeo at least and certainly most fields of biology I know, it’s common for the last author in a string to have been in some kind of supervisory role. Senior researchers at the head of labs are often in this position though they might have made a considerable contribution to the paper. In know that in China however, this is generally not the case and authorship lists there tend to more reflect levels of contribution, though confusingly this can also integrate levels of seniority (so Professor X might be listed above researcher Y even though the latter did a bit more). Certainly different people can be on papers for very different reasons and it’s certainly not uncommon for people to be in papers for which they have written not a word. That of course doesn’t mean they didn’t contribute – they could have collected important data, run analyses, found or prepared the original material, been involved in discussions or generated the ideas the work is founded on, generated funding to support the work or a host of other technical and academic contributions without necessarily being involved in the actual writing. In some cases the final paper contains none of the persons’ contributions because it was cut out, but they remain on their in reference to their efforts and time (and quite probably money) devoted to the project. All of this adds up to a confusing picture and while some papers can be read and each author’s contributions laid bare, others are rather more complex. If nothing else, there is a huge difference between a genuine collaboration between ‘Smith and Jones’ where each did 50% of the work (and you can even see joint first authored papers these days) and a ‘Smith and Jones’ where the latter was the former’s supervisor who helped the project into being, and deserves his credit, but did perhaps 10% or less of the paper. Hence the inevitable issues when you get to 5 or even 10 authors and the conflicts that can arise and of course, the confusion that can arise when reading a paper. A while back I mentioned that I had sort of ‘reserved’ the new pterosaur specimens in Toyko to work on. 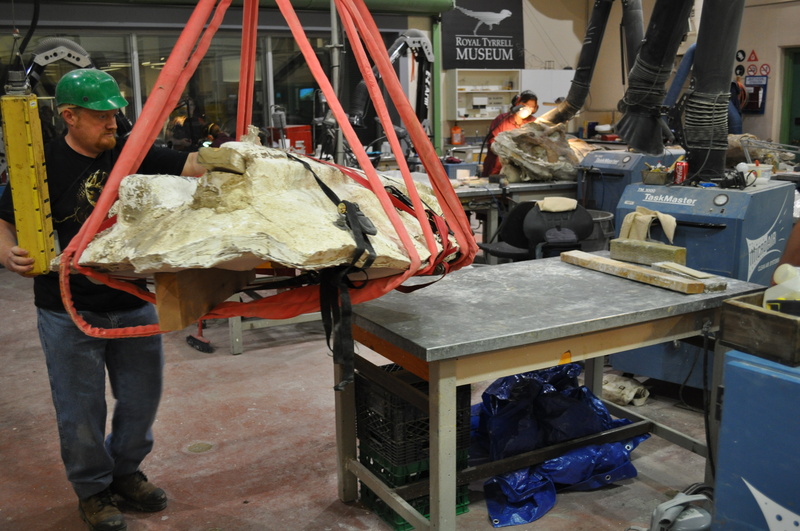 This practice is pretty normal in vertebrate palaeontological circles – there are only so many specimens available and it can take a lot of time and money to go and see something. If you spend that only to discover that someone else is already publishing on that material then it’s rather wasted and your funding body may not be too impressed. As such if you have an invitation to work on something or have seen something and the curator has agreed that you can work on it, the unwritten rule / general consensus is that this is your ‘exclusive’ specimen and no one else should work on it without permission until your work is done. This can apply as much to revisions of old material as new specimens but the general idea is the same. Obviously if you come across something and are informed that someone else has ‘reserved it’ then you need to get in touch with the ‘owner’. Naturally, many people are happy to collaborate on something, or are happy for people to do minor work like code something for a phylogenetic analysis, or even carry on as normal if the work is completely non-overlapping (say you want to take a histological sample and the other guy is only interested in skeletal proportions or doing and FEA analysis of the skull). In theory at least this also means that if you can’t get the work done for whatever in a ‘reasonable’ amount of time, then you should make it clear and let any circling people into the fold and let them do their work (and if they are being generous, they should try to involve you). When this all works, it works well. People can guarantee they won’t be gazumped after writing a grant or spending all their cash to do a piece of work, and others know what they can and can’t do in advance. People can collaborate or tailor their projects to build up a piece of work or avoid toe treading and feelings can avoid being hurt. Of course there are those who either cling on to stuff they can’t (or won’t) work on and there are (true) horror stories of specimens being withheld for decades while someone (allegedly) works on them and at the other end, some people try (and even succeed) in publishing on things they have been told other people are working on. It is imperfect, but in my experience at least it generally leads to much better working practices and less confusion and paranoia, than simply declaring anything up for grabs. Some pieces come off in large sections. 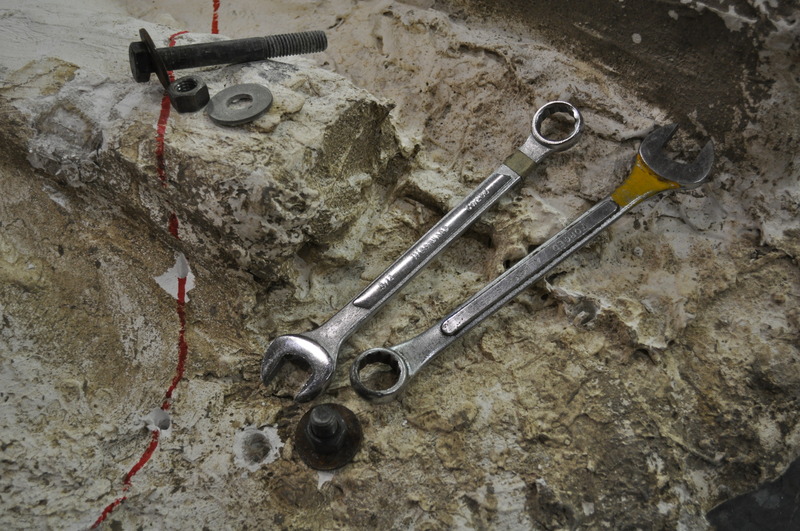 A block of wood is useful as a fulcrum with the screwdriver(s) to pry up the plaster bandages. 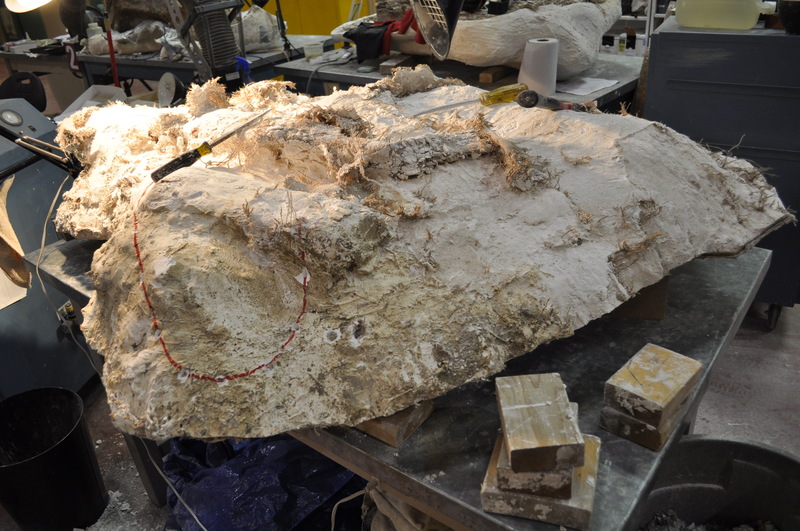 After 1.5 days of pulling and tearing, most of the jacket was off, rock was showing and the ilium uncovered in the field was also seen again for the first time in several years. 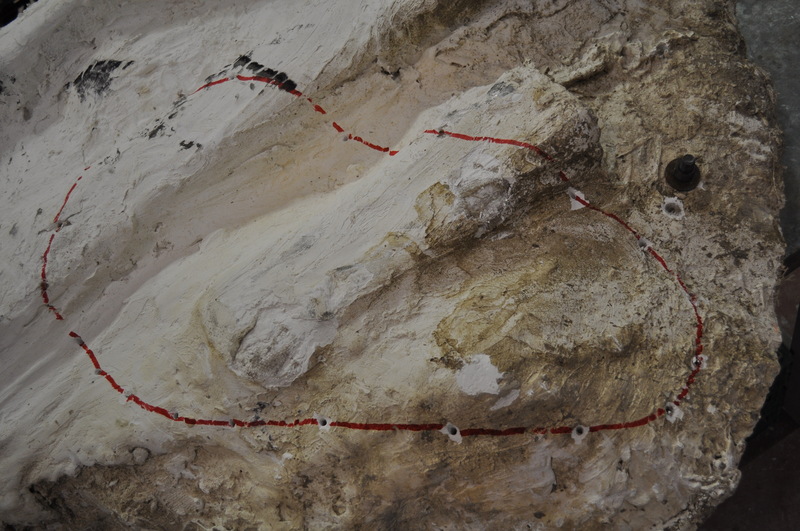 The skull was outlined again with a red felt pen using the drilled holes. As the jacket got thinner, a quite large piece wanted to lift off the skull area. This was too big, so I used a cast cutter to cut two parallel lines through the jacket and pulled out the plaster and burlap in between. 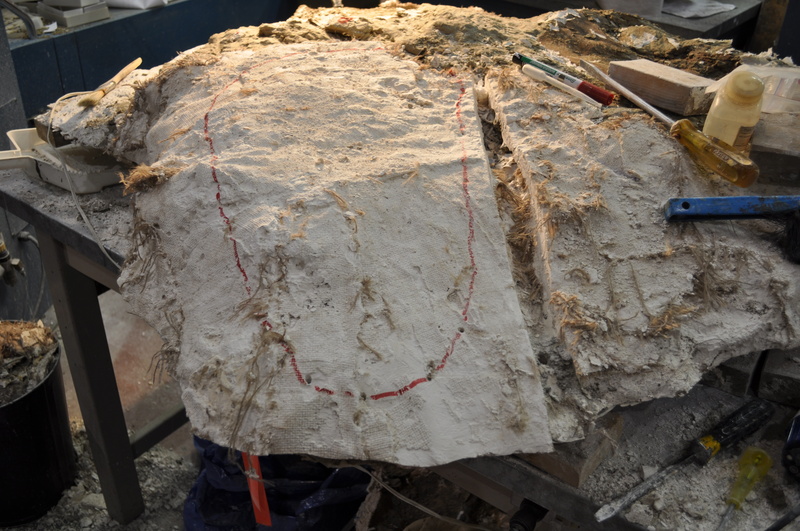 This separated the remaining jacket into two pieces and the plaster/burlap covering the skull section was lifted off easily. By doing this, the jacketed skull was seen. 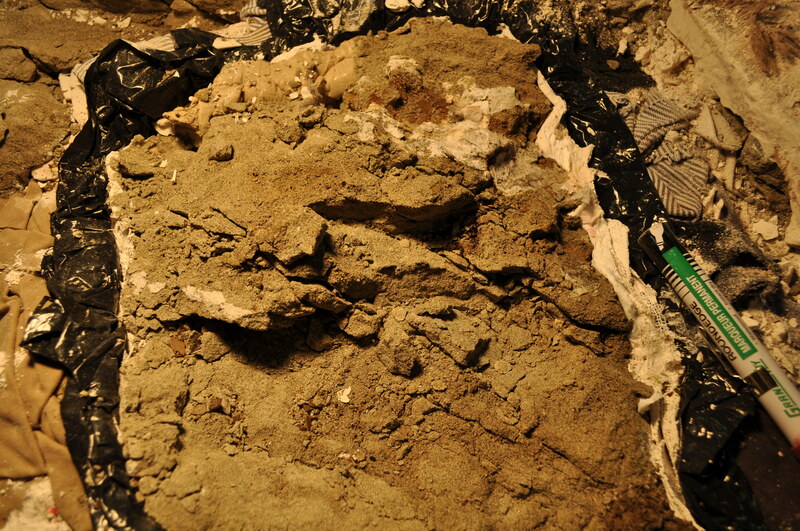 The rags and black plastic sheeting was exposed and removed- the latter with a razor blade. 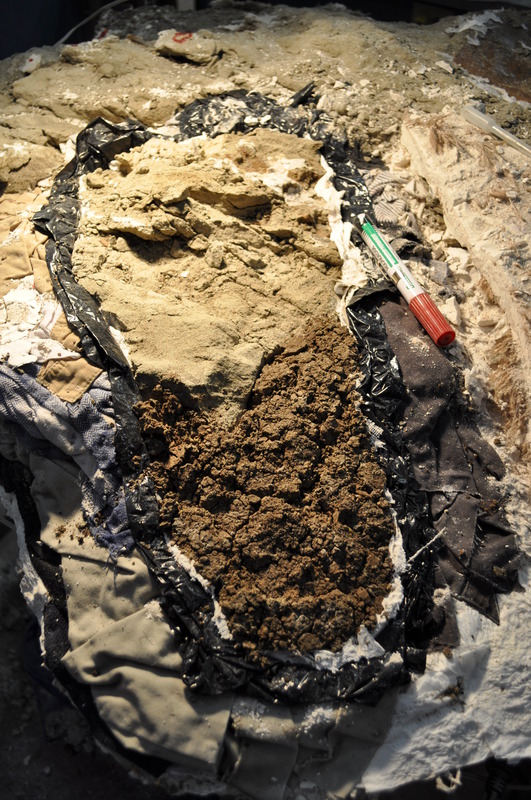 The skull jacket looks odd with white sandstone and dark brown mud, but the latter was a poultice I mixed up and put on the exposed snout to protect it from the jacket- I did not want the jacket pressed right against the skull. 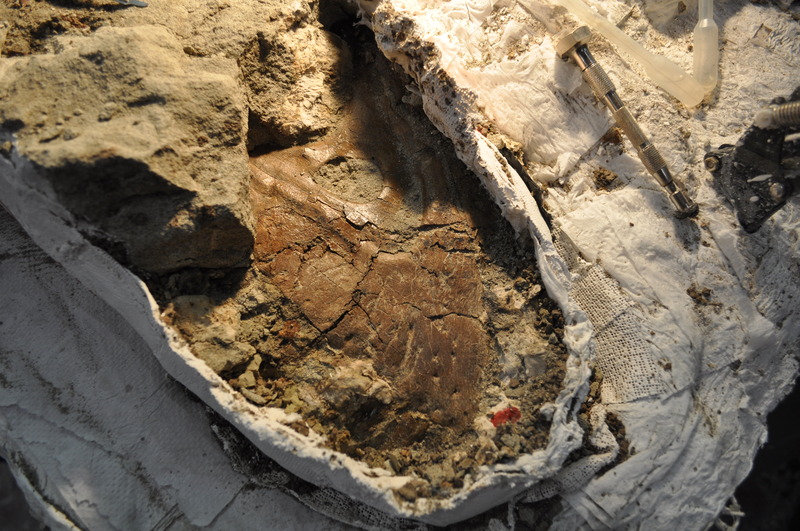 The poultice of dried mud was removed and preparation on the skull begun again. 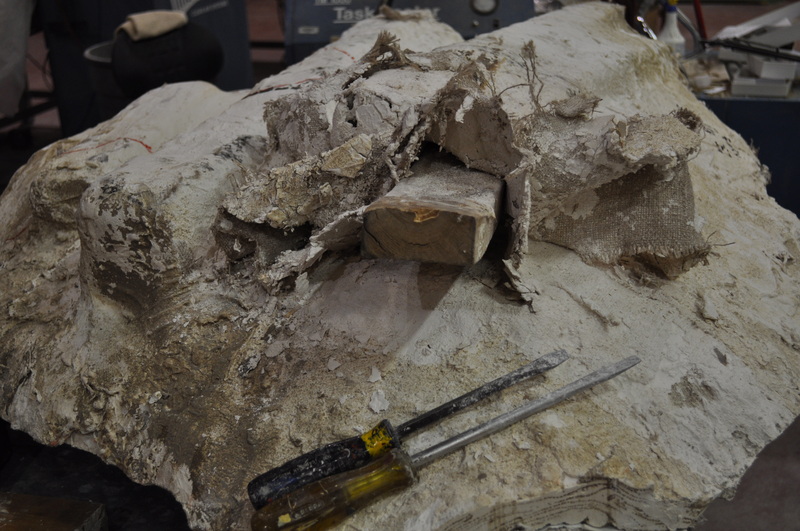 The skull is definately incomplete on this side and the bone seems more poorly preserved- the bone is very splintery. Several of the teeth show white meandering markings (root etchings) made by modern plants as they grew against the specimen. 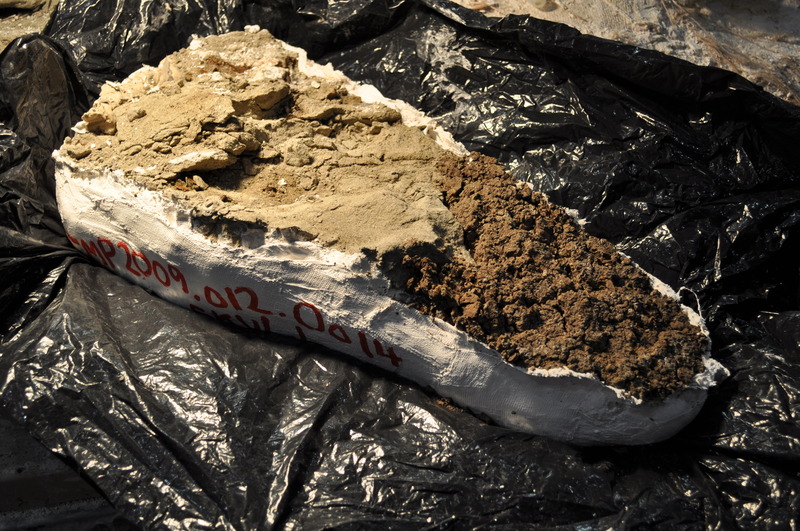 It is thought the roots leach minerals out of the fossil with possible negative effects on the fossil. 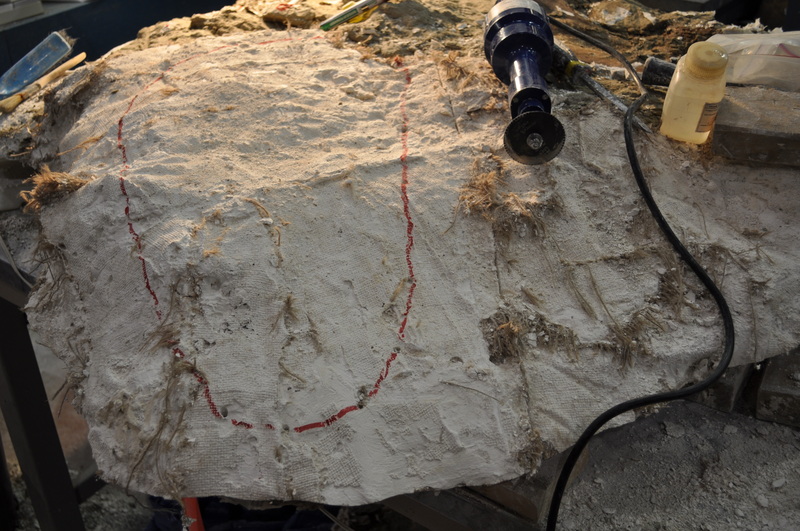 The rest of the exposed rock was allowed to dry out and when done, glue was squirted into the cracks, etc to stabilize it for the upcoming preparation. Fieldwork for me starts very soon so these will likely be the last postings from me for some time. [Actually Darren has already gone I think, I’ve just had this sat waiting for a while]. 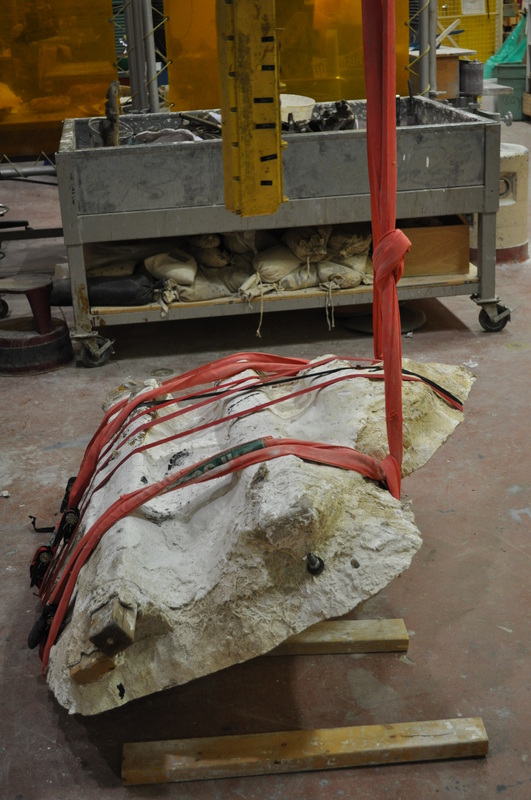 Darren Tanke’s Gorgosaurus preparation 31: Pulling off the jacket 1. Dave writes: I’m nearly over my jetlag and am now settling down to the business of working at the IVPP. Sadly there’s nothing on display I haven’t shown off before and I’m still behind on writing some posts of m y own. 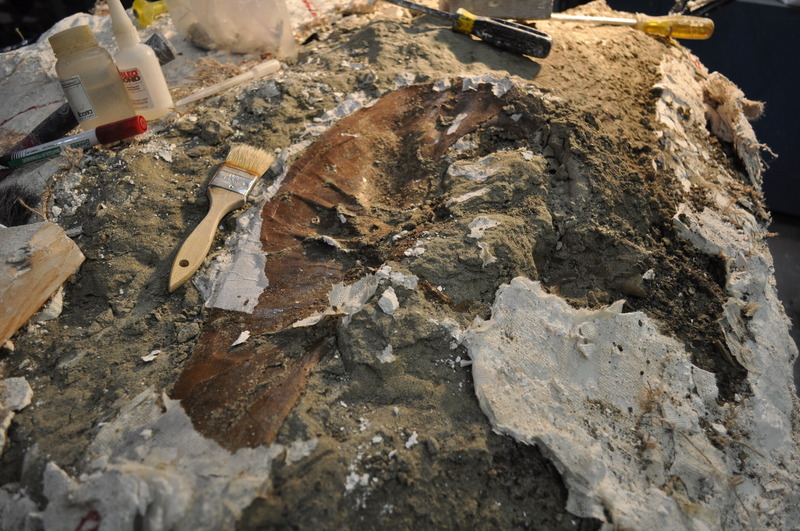 So for now you’ll have to settle for yet more Gorgosaurus prep. Now comes the “fun” part, taking the original field jacket off. 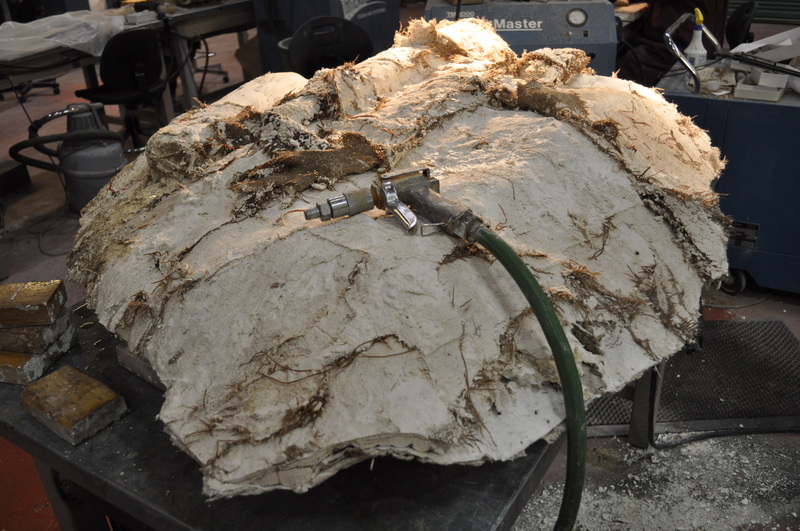 Often we use power tools such a reciprocating saws and remove large pieces of the jacket, but the specimen is too fragile and nice to risk it as these tools cause vibrations. First the bolts were removed. Usually with a field jacket, the first few layers (there are about 6-7 on this in total) come off easily by hand, so the edge of the burlap is found and simply pulled away one piece at a time. Because the pieces overlap and are covered in plaster it is hard to see where one piece starts and end and sometimes you end up pulling on a lower piece and it tears into smaller bits. On average, the pieces here came of in hand-sized bits. A couple large flat-headed screwdrivers were good to get under the burlap and lift it up and separate the layers. 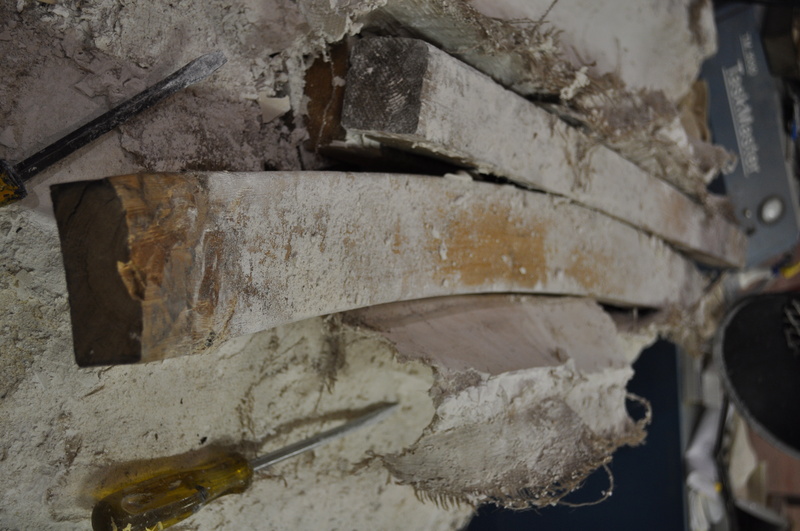 All the supporting 2 X 4 timbers used as splints in the field jacket were removed and saved- they can be used in another jacket someday. 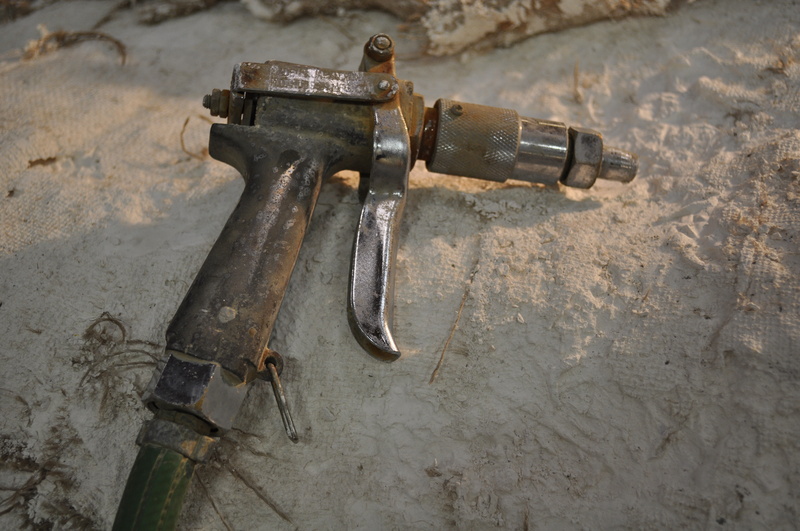 Once I got down to the harder plaster I used a water spray gun to soak the plaster/burlap. This softens the plaster and makes removal easier. Many people uses water-soaked rags for this step, but the water hose was close by so I just sprayed it lightly. After soaking in for 10-15 minutes the pieces came off more easily. Removal of a plaster jacket piece by piece by hand is tough on ones fingers and hands and time consuming- the better part of one day (7.5 hours work) was needed to get this far. 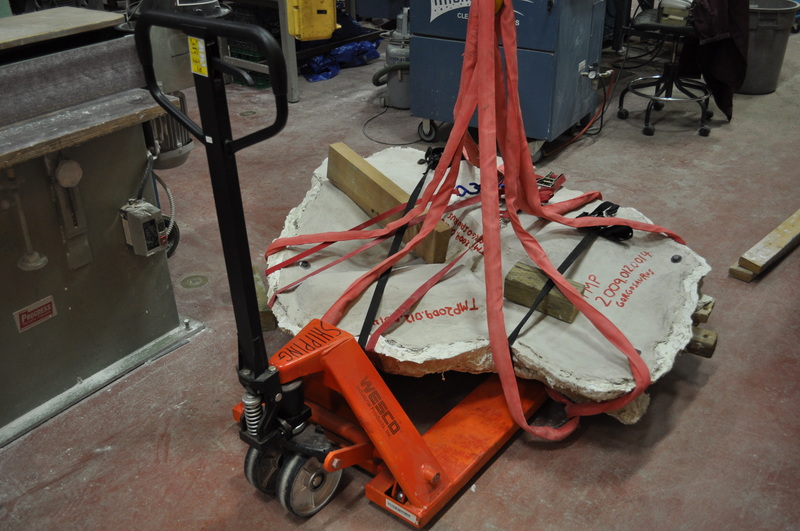 The block is lifted off the table by a large overhead crane (it runs on tracks mounted near the ceiling and can move 4 directions) and lowered onto a pallet jack. Then it was taken to a larger empty work area nearby. 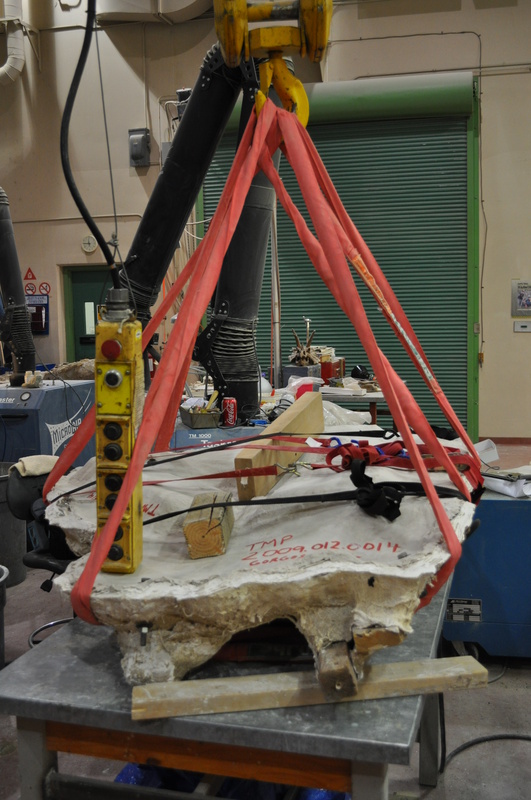 The red lifting straps are readjusted so when the block is lifted it now stands vertically, then the whole crane is moved over and simultaneously the cable lowered so the jacket comes to rest “upside-down”. Actually it is now in its original field orientation. 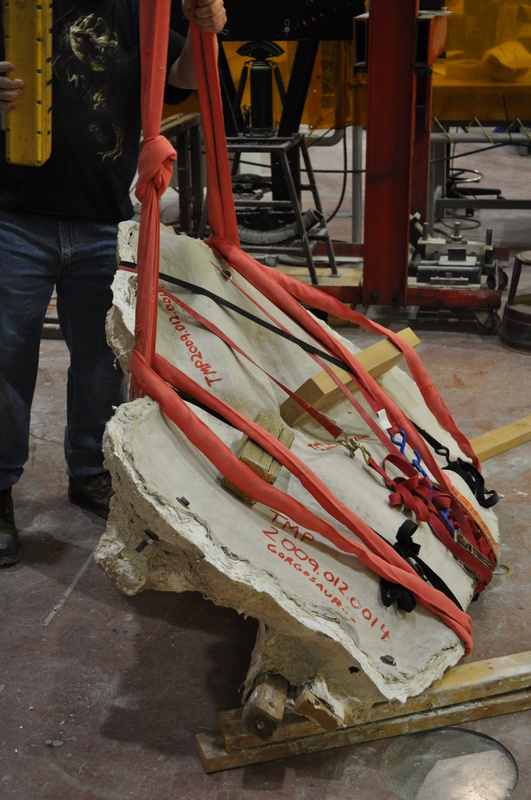 The flipped block is put back on the pallet jack, wheeled over to the work desk, the straps readjusted a final time and the block lifted back onto the table. This work is always done with others helping for safety reasons. Once the block was on my work table I was able to refind the holes I drilled through days ago and “connect the dots” with a red marker pen. Now I know exactly where the skull is positioned inside. Now the manual labor of pulling the jacket off begins!